Hi Alexis, tell us a little bit about yourself. 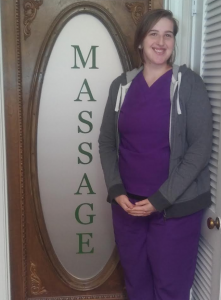 I was born and raised in Memphis and have been a LMT Licensed Massage Therapist since 2014. I have a daughter, a dog, and a STRONG urge to help others. When did you join the Back and Neck Specialists? I joined the group in January as a complementary therapy to chiropractic health. How long is a massage therapy session? Depending on how chronic (ongoing) your symptoms have been, a one hour session is a great start before an adjustment with Dr. Cole. If you are in better health or have already been seeing me for treatments for a few months we can do 30 minute sessions to complement your adjustments beforehand. If you have chronic pain or have a wide variety of symptoms and need deep tissue work or trigger point therapy then I suggest a 60-90 minute session to give me more time to work with specific concerns. Are your services covered by insurance or cash payment? We accept cash, debit, or credit cards. We are not currently submitting insurance claims for massage therapy but we can provide a detailed receipt for you. In some cases your insurance carrier will cover massage therapy for reimbursement if it is prescribed by your primary care physician. What do you like most about being a LMT? Definitely helping people and seeing something that I am doing proactively improve a patient’s quality of life. The biggest incentive for me joining the Back and Neck Specialists is the opportunity to learn more about the relationship between an individual’s skeletal system, nervous system and muscular system. Learning more about how these systems work together is a passion of mine. Every patient’s body is different, therefore each patient’s treatment is different. If you have never had a massage before, I hope it is something you will be open to. Even if you don’t think you are holding tension, massage can help you become aware of your breath, re-oxygenating the blood stream and thus increasing circulation. Gravity and stressful lifestyles can cause stagnation in the body. Massage can ensure better circulation and better overall function.